The Lowrance HDS-8, our complete independent unbiased review. The Lowrance HDS-8 is a multifunction display that serves as both a marine chartplotter and Broadband Sounder ™. It also contains an internal GPS sensor. The unit came preloaded with Lowrance Nautic Insight ™ U.S. Coastal cartography. The HDS-8 package includes the display unit, mounting bracket, dual-frequency transom-mount transducer, operations manual, installation manual, quick start guide, and a combination NMEA0183 data/power cable. 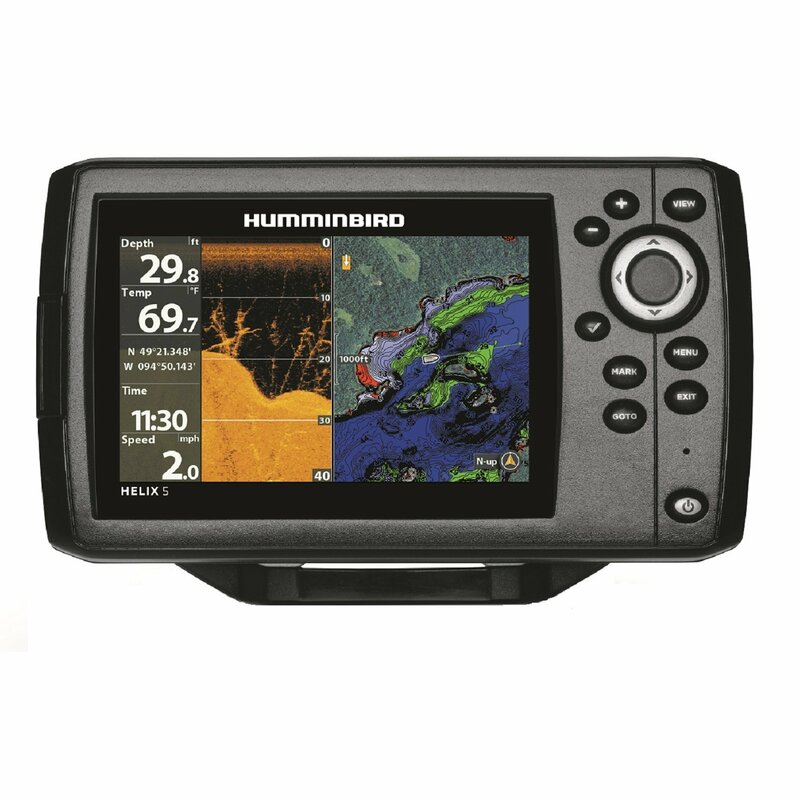 The HDS-8 can also be purchased as a standalone chartplotter or standalone fishfinder. The display unit measures 7.8-inches high by 10.5-inches wide and just under 3.3-inches deep. We used the accompanying gimbal bracket to mount the Lowrance HDS-8 to our test rig. A removable front bezel allows for flush panel mounting without the need for any additional hardware other than mounting screws. 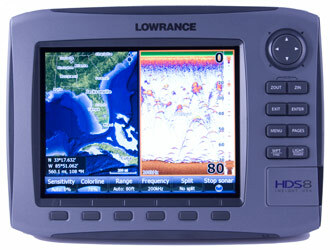 Buy this Lowrance chartplotter here. The Lowrance HDS-8 has two chart-card slots and can use Navionics Platinum and Platinum+ charts as well as any Navionics inland lakes cards. When connected to the appropriate optional sensors the HDS-8 can display radar data, Sirius marine weather and radio, broadband side scanning sonar using the LSS-1 black box, and a variety of engine information. A single cable with a twist-lock connector attaches to the case back and supplies both electrical power and NMEA0183 data through individual cable legs. The display houses a 16-channel GPS sensor, although the unit can use an optional external GPS sensor if needed or desired. I used the internal antenna for this review. This unit can also interface with NMEA0183 devices, a NMEA2000 network, and Navico Ethernet. NMEA0183 data transfer rates of up to 38,400 baud are supported. I planned to use the Lowrance HDS-8 to do some on-the-water testing of the new Lowrance StructureScan ™ LSS-1 Broadband Sounder and this combination requires software version 2.5 or higher. The unit shipped with software version 2.1 so Id have to perform an update. I did so by installing a card with the new software into one of the HDS-8 card slots and then cycling the power off, then on. A number of messages flashed onscreen as the update loaded followed by a completion message and instructions to cycle the power for a reboot. This whole process went flawlessly and took less than three minutes to accomplish. The card I had with the new software (version 2.5) was sent to me by a Lowrance technician. This software is also available for download online at the Lowrance website. Software version 2.5 adds support for StructureScan and allows the display of up to 4 windows on the HDS-8 or HDS-10. A long list of other enhancements is also provided by this software update. The HDS-8 is equipped with a 6.4-inch wide by 4.8-inch high display screen. The high contrast color LCD screen measures 8-inches on the diagonal and supports 800 by 600 pixels of resolution. The Lowrance HDS-8 display screen is razor sharp, bright and easy to read. When viewed from straight-on the HDS-8 screen maintains excellent brightness even when viewed wearing polarized sunglasses. At steep side angles I noted no screen darkening or reduction in readability. I rated this Lowrance unit excellent for daylight viewability. No screen fogging was apparent in the display at anytime. The HDS-8 has both a day and night color palette. The night palette changes numbers and letters onscreen to a darker color for easier night viewing. Night palette has little to no effect on the radar or chart pages. On the sounder page colors invert for improved low light viewing. Screen brightness can be set to one of ten levels using the keypad and switched to one of four levels using the light/power button. With the brightness set to minimum the screen goes nearly black. The Lowrance HDS-8 uses eight single or dual function pushbuttons, six soft keys, and a touch-flywheel equipped keypad to control functionality and manipulate onscreen menus. The keypad ring allows the user to scroll menus by placing a finger on the ring and moving as desired. Up to four windows can be displayed with the latest version 2.5 software. The top two windows are side scanning sonar. The bottom left is the chart page and the bottom right is the sounder. Page appropriate soft key functions appear onscreen above each pushbutton. The user can select from one of seven main pages, Radar, Chart, Sonar, Structure, Steer, Waypoints, and Info. A full screen page view or combinations view can be set using the Pages button, keypad, and Enter key. Combined pages are shown in two windows. Certain combinations of up to four windows can be shown from the Structure page. Window size is user adjustable. Switching control from one window to another is accomplished by holding the Pages key. A graphic menu makes choosing page combinations very easy. Page specific menus are available for the radar, chart, and sonar pages. These menus provide another way to access certain functions that may or may not be listed as a soft key task. A single press of the Menu pushbutton accesses the page specific menu while a second press of the Menu button brings up the main menu. A myriad of customized data can be overlaid on any page in either an analog or digital format. It is a snap to add a waypoints with the Lowrance HDS-8. A double press of the Waypoint key will add a point at the boat or cursor position, your choice. Once a waypoint is created, soft key options appear that allow you to Edit or Go To the point. Selecting the Edit function lets you change the waypoint name, position, symbol, or color. Clicking the More field lets you add a comment, record the depth, and set an alarm radius around the point. I like the ability to add comments to waypoint data. Even a long waypoint name doesnt tell the whole story. Pressing the Go To soft key draws a line on the chart to the selected waypoint. It also activates and displays numerical and graphical navigation data to the point on the Steer page. Two functions I really like are the cancel navigation and restart navigation options. Waypoints names can be up to 25 characters long, use one of 70 symbols, and display in one of seven colors. The HDS-8 can store up to 5000 individual waypoints. The easiest way to build a multiple waypoint route in the Lowrance HDS-8 is directly from a full screen chart page. To start the process youd hit Menu and choose New Route. As you move the cursor to a new position use the soft key Add function to add waypoints. More soft key options will be displayed once you start adding points. When your done save the route. Already built and named routes are listed on their own page. Each route waypoint is listed with bearings and distances between other points. You can modify, start, or delete a route here too. You can run a route in either forward or reverse. The HDS-8 can store up to 200 routes with as many as 250 waypoints in each one. The Lowrance HDS-8 man overboard function activates by pressing both zoom keys simultaneously. When MOB is activated the unit automatically switches to a zoomed full screen chart page view, saves the MOB position, and displays the MOB position in the lower left corner of the screen with bearing and distances. I like the single action MOB functionality of the HDS-8. In my opinion, it provides enough navigation information for an experienced helmsman to return to the MOB position quickly and precisely. When ranging out rapidly on the chart page youll see details shrink and obscure and then a second or two later redraw. When rapidly ranging the HDS-8 chart in things grow then rescale. It seemed to take about the same few seconds to redraw whether ranging in or out. I found redraw speeds on the HDS-8 to be adequately fast. This Lowrance chartplotter has three chart orientation options, North Up, Course Up, and Heading Up. All worked well. Placing the cursor over an object of interest, and then hitting the Info soft key lets you know what services are available at the location. You can also use the find soft key function to go to a variety of menus that will locate a specific object of interest. One my favorites were the large number of fishing icons (fish symbol inside red box) scattered around the HDS-8 chart page. When you point to one of these icons and display the information youll get an inside scoop of fishing knowledge for that specific area. The Lowrance HDS-8 internal sounder uses broadband digital sonar technology to enhance sounder operation. Because this is a digital unit output power is not a viable measure when comparing to a conventional analog sounder. Sensitivity of the Broadband Sounder is so high very little output power is required. You can read about how the sounder performs in our HDS-10 fish finder review. Both units use the same sounder and display data on screens with equal resolution. The HDS-8 has a 2-year warranty and an IPX7 waterproof rating. The Lowrance HDS-8 can be purchased in a number of configurations with a variety of cartography and transducer options, make the right choice before you buy.